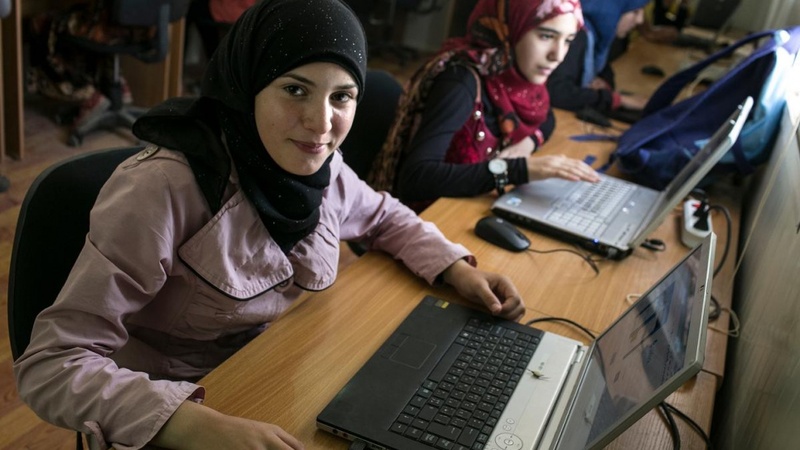 “This startup helps Syrian refugees earn a living.” “Recent Columbia Grads Launch Startup That Empowers Syrian Refugees.” “Arabic language startup helps Syrian refugees find hope, income.” The headlines and attention have been widespread. 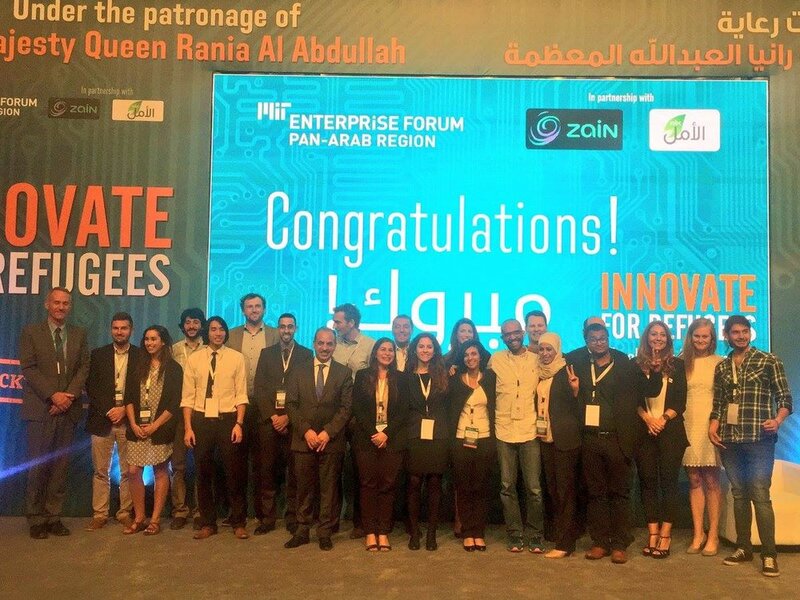 They all refer to NaTakallam, the startup catapulted into spotlight in 2015 following the launch of its pilot program in Lebanon. Since then, NaTakallam has connected thousands of Arabic language learners with Syrian refugees as paid language tutors and conversation partners via the Internet. Here, co-founder Aline Sara discusses the motivation and strategy behind launching a social enterprise to empower refugees. Why did you and your team decide to start NaTakallam as a for-profit social enterprise? We’re still debating how we will end up finalizing our registration—we’re an LLC right now, looking at the B-Corp certification. We are looking at these models because we sometimes feel there is a lack of efficiency in the not-for-profit sector. There are so many studies coming out about how social ventures are a new, efficient way to work and generate impact. We’ve reached such a tremendous level of crisis in the area of refugees and migrants that, clearly, we need to rethink our approach. For us, we have a revenue model. We don’t need to rely on fundraising. If we’re generating our own income, why compete with all the other NGOs who don’t generate their own income, and who depend on funding? Let them take that funding, and let us grow, generating our own revenue, and generating our refugees’ own revenue. We would also like to have independence and not be dependent and locked down by external funders. We’re working on an issue that is, sadly, seen as political and as a result, not neutral, although I wish people could look at refugee issues as neutral, regardless of their nationality or religion. When you say Syria, when you say refugees, unfortunately for many, there is a bizarre—and inaccurate—connotation in the discourse we’re hearing today. And finally, as a small startup, we can take risks. We can take a leap of faith to onboard a Syrian who is writing to tell us he just landed in Paris and he’s waiting to get refugee status, which he might not get or he might lose in the long run if he has to be repatriated. We’re taking the risk of onboarding individuals who do not have a fully-established status, and we can afford to take that risk, after interviewing them, doing our own vetting and following up closely on user satisfaction after working with them. We had nothing to lose when launching so we could afford to move fast. We’re not like an NGO that has donor money and their reputation on the line. And now, others are coming to us to hire refugees—the International Rescue Committee has recently hired our Syrian tutors to be social media moderators on their Refugee.info website. What is the current situation in host countries like Lebanon, Jordan, and Turkey for refugees and displaced people who want to participate in the local economy? Unfortunately, today we think of refugees in such a general sense. We use the word “refugee” and we have this quick image of what a refugee is that appears in our mind. There are 65 million displaced people in the world today—it would be one of the largest countries in the word if it were down to a nation, and we all know that a whole country or continent has individuals with different profiles, ages, and education levels. Additionally, refugees faced different challenges in different places, even if they are all from the same origin. For example, Syrian refugees in Lebanon have a different situation from refugees in Germany, or in Brazil. It’s hard to talk about refugees and not acknowledge the many different layers. In Lebanon, for example, there are around 1.5 million Syrian refugees. The vast majority of them are not allowed to work in the local economy. They might get a temporary stay, but they’re not allowed to work unless it’s in a very low-paying job, frequently positions in garbage collection or construction work. Even in Europe, asylum seekers are not allowed to work, though when they become a refugee, they can. We’re also able to work with these asylum-seekers while they’re in waiting. So much of being a refugee is defined by waiting. You can fall into depression and poverty along the way. We tend to think of refugees as poorer individuals who might have not had a chance to get that much education, but that’s not always or even often the case. At NaTakallam, we’re tackling a forgotten niche in the refugee world and community, which is people who had completed, or were in the process of completing, their degrees—those who finished their undergraduate studies, or their Masters, and who were in middle to upper-class jobs. Pre-war Syria had one of the highest literacy rates in the Arab world. We’re talking about a very qualified people. When you’re looking at 11 million Syrians displaced, there are going to be several hundred thousands, or millions, who are very qualified people, who would have pursued careers in engineering, medicine, law, and other professional jobs. We’re tackling that issue. Through NaTakallam, we want to help them feel that they can do work that is more reflective of their skillset and their level of education. We do this by giving them an opportunity to teach a language. Teaching a language takes skill and education, but is something you can pick up, you don’t need to be as specialized. While they might be barred from working legally in the local economy in Lebanon and forced to work in the black market, typically for much lower wages, we, as an American company, are hiring them through the Internet economy. We’re able to work with individuals regardless of their official status as a refugee with UNHCR. We’re giving them a rate of $10 USD per hour, which is higher than minimum wage in many states in the U.S. In Lebanon, the minimum wage is $4.50 USD per hour. They can hit that by working for NaTakallam just 45 hours per month. It sounds like you’re not trying to create an initiative that applies to the whole refugee population—you’re targeting a very specific segment. So many international and aid organizations want to target a massive amount of people. While it’s well intentioned, it’s vague. The start-up mentality has taught us to stay very simple, very specific, and “master this arena.” That’s why at this stage, we have turned down Iraqi refugees, Palestinian refugees, and others. We’re very focused on Syrians right now. Once we get to a point where our team has salaries, we have an office, and a more solid set-up, eventually we will look at how to expand and adapt to other communities. NaTakallam is a replicable concept, even with other languages and other tasks. We are looking at eventually applying this model to other languages. French is one of the most popular foreign languages in the U.S. Today, we have many Western African Francophone refugees—a lot of them are asylum-seekers, intellectuals who have had to leave their country for political reasons, and they have very good French. What if they could become French tutors? We could apply this to Iranian refugees for Farsi, Central American refugees for Spanish, and in translation and interpretation services. But for now, we are very specific and very simple. I sometimes wonder what would happen if we were to reshape the world into small social ventures or initiatives that communicate and coordinate efficiently, all while remaining separate, small, and focused. It may be a more effective, and more efficient, approach overall. You are running this social enterprise that intersects with the humanitarian and aid sector. What have been your impressions of the large-scale approaches to humanitarian aid delivery? In hindsight, when I look at how much money we have spent, given the fact that we started with nothing, from zero, I feel we have been quite efficient. We got around $40,000 USD last year through grants, private funding, and “cute” donations from friends and family, as I like to call them. As of today, the refugees have generated for themselves some $50,000 I sometimes feel that with big institutions, the bigger you become, the more your efficiency slows down. Because we’re so small, we don’t have to deal with bureaucracy that United Nations departments like the UNHCR or major international implementers like the International Rescue Committee have to deal with. Bureaucracy seems to have become a major problem in the humanitarian sector and international organizations today. It slows things down. I know from my time at the United Nations that these large budgets are sometimes not always used, or they are used sometimes on trivial things. Not all of them—some of them are doing wonderful work—but we’re seeing a lot of inefficiency in many of these major organizations. Based on your experience with NaTakallam, what are your key takeaways for addressing displacement while also supporting dignity and economic empowerment of refugees? It’s very simple: give someone a sense of purpose. Treat them like a normal person. We have a tendency to infantilize refugees. The ones we’re working with teach me things. They do need help, but they’re not helpless people. The difference between giving aid and giving a job is immense, especially a job that is rewarding and has a human component, when this community has been so demonized. NaTakallam has been able to create jobs. There’s nothing like having a job and a sense of purpose, even if it’s for a little amount of money, especially when you’ve been used to working your whole life, you’ve enriched yourself your whole life, and have so much to offer. Especially in places like Lebanon, Jordan, and Turkey, I feel very strongly about how the countries in the region are shouldering the biggest responsibility. Lebanon has the highest density of refugees—1 out of 4 people in Lebanon right now is a Syrian refugee. There are studies showing how much more impactful, and better for the host country, it is for refugees to generate their own income, because they then spend it in the local economy. NaTakallam is still less than a year old. Where do you see NaTakallam in the future? NaTakallam is focusing right now on partnerships with universities. Our goal is to tweak the mindset of people teaching language in universities, and invite them to use NaTakallam as a complement to the classroom. We’ve started with George Washington University and Swarthmore College, and just this month, Boston College and Tufts University confirmed that they’re coming onboard for a pilot. The idea is what when students are taking Arabic, they are provided with an hour per week of access to NaTakallam for additional tutoring or to practice what’s learning in the classroom. Having schools around the world bring this on will be great, affordable extra language-learning practice for the students. It’s livelihood to refugees. It’s also awareness-raising. The refugee crisis is so massive today that everyone needs to be aware and involved and at the very least, people need to not fall into the cycle of xenophobia and hatred of the outsider. When you are young, when you have a personal one-on-one relationship with a refugee—this mystified idea of refugees that you hear about in the news—you will create a generation of awareness in younger people that will help drive them toward being open-minded, not living in fear and stereotyping of the other. The value will be multifold. As an American-Lebanese who comes from these worlds—the Middle East and the Western world—that are polarized in the media and political spheres, this is a really interesting outlet and opportunity to bridge the gap. Getting universities and high schools worldwide on-board, and expanding to other languages and communities as a result—I would say that’s our current biggest dream. No Replies to "A SENSE OF PURPOSE: ECONOMIC EMPOWERMENT FOR REFUGEES"